"That was the most interesting and weird performance." 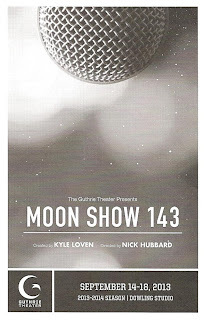 I heard these words in the elevator ride down from the Guthrie's 9th floor Dowling Studio Theater, and I really can't think of a better or more succinct description of Moon Show 143. Seattle-based Kyle Loven brings his unique creation to the Guthrie for just four performances. He uses a combination of movement, puppetry, and sound to tell stories of the moon, without words. It's truly bizarre, at times perplexing, at other times beautiful. Kyle is the main performer, joined by Paurl Walsh as a sort of D.J., mixing sounds electronically and providing sound effects. Dressed in black and with a face painted white, Kyle represents the moon in various forms. The piece is divided into four parts, as the large square metal frame is turned so that each side faces the audience, setting up a new scene. Various props hang from the frame, from articles of clothing to body parts to miscellaneous apparatus. The four stories show different sides of the moon. A sweet little boy puppet, represented by a head, hand, and Kyle's feet, learns the lesson "Don't point at the moon or the moon will cut your ears off." A man (a torso-only puppet) attempts to get to the moon using various techniques. The moon looks at herself in a mirror and is surprised by what she sees. An elderly couple rediscover their youth. Or at least that's what I got out of it; what's actually happening is a little unclear and open to interpretation, which is not a bad thing. It doesn't follow the usual structure of theater, so that the ending was unexpected and the audience seemed to linger for a bit, not really sure if it was over. 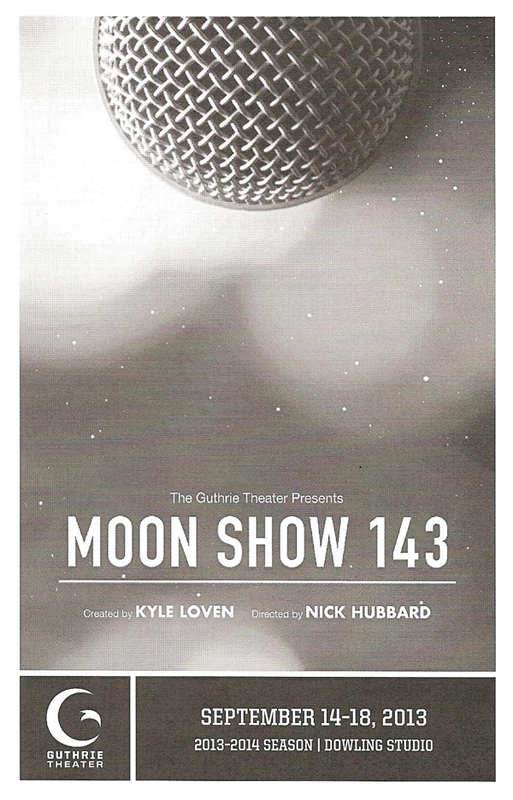 Moon Show 143 is definitely strange and bizarre, and not really my kind of theater, but it is quite captivating. It's creative and inventive, which I always admire, even if I don't quite get it. If you're looking for something out of the ordinary, this is it.